You’d think six lunar landing sites 238,900 miles away from Earth wouldn’t need to be protected. Admired on a warm, summer night? Yes. Written about in poetry? Sure. But not protected. Wouldn’t the distance alone keep curious Earthlings from ever disturbing those sacrosanct stretches of moon rock, dust and irreplaceable lunar artifacts? Happily, no. Humans have not turned their backs on the Moon. The US, the EU, China, Russia, India and Japan have all spoken openly of sending astronauts back the lunar surface. And that’s not all. At least five private companies from around the world have the Moon in their sites. SpaceIL, Moon Express, Synergy Moon, TeamIndus and HAKUTO are vying for the Google Lunar XPrize. There may be a private rover on the Moon before this year is over! We not only support, but applaud and celebrate all these efforts. However, we also believe that we need to preserve our human heritage on the Moon. For All Moonkind, Inc. is a not-for-profit organization whose sole mission is to assure the six Apollo Lunar Landing Sites are recognized for their outstanding value to humanity and consequently preserved and protected for posterity by having each of them included on the United Nations Educational, Scientific and Cultural Organization’s (UNESCO) World Heritage List or the List’s outer space equivalent. On 16 July 1969 a Saturn V rocket lifted off on a historic voyage. 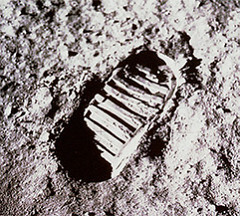 Four days later, millions of people watched as the first human footprints were set on the Moon’s desolate surface. They were envoys of all humankind, propelled to the heavens on the ingenuity and perseverance of thousands of scientists, engineers, tool workers and dreamers from around the globe. The boot prints have been undisturbed – and they should remain that way. This is not to suggest that any Earth-born Moon walker would go out of their way to defile the landing sites. But what if? It is not difficult to imagine the damage an autonomous vehicle or an errant astronaut – an explorer, colonist or tourist – could do to one of the Apollo Lunar Landing Sites, whether intentionally or unintentionally. It would be like allowing tourists to roam freely through Lascaux or Petra, touching what they will. The desecration, even if borne of innocence, would be devastating. The UNESCO World Heritage Convention has been a great success, helping preserve natural and cultural landmarks around the world. From the Tsodilo in Botswana to the Taj Mahal in India, the achievements of humankind have been recognized and conserved. But as humankind stretches its reach into space, so must the United Nations and UNESCO. 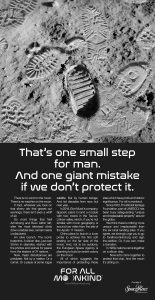 Just as we revere fossilized footprints of a long-forgotten hominin species in the Ngorongoro Conservation Area as evidence of the development of human bipedalism, we must preserve our first footprints on the Moon. Each of the Apollo Lunar Landing Sites is evidence of humanity’s first tentative steps off our planet Earth and to the stars. They mark an achievement unparalleled in human history, and one that is common to all humankind. And they embrace, and poignantly echo, our continued efforts to achieve peace. What better way to reintroduce humankind to the Moon, then in the international embrace of a world community come together in understanding of our shared history, heritage and future.